Joseph Carens has written a brilliant and stimulating book. I can’t remember the last time I filled a book with so many marginal jottings, either because he had made a striking point that I wanted a reminder of, or because what he said was so thought-provoking, or, often, both. I agree with the vast majority of Professor Carens’s conclusions. It would make a boring symposium contribution to just list points of agreement, so I’m going to spend a bit of time here on a few points where I don’t agree. Now I’m sure you’ve heard a philosopher give an introduction like that once or twice before, and it can sound rather trite. So I want to start with a couple more positive things. The fact that the book is so rich, that there are things worth talking about on basically every page, means that it would be a joy to teach. I don’t think there are many philosophy departments around that currently have on the curriculum a course on the ethics of immigration. Here’s some free advice to my fellow philosophers: Add such a course, and have Professor Carens’s book be a central text in it. You’ll get a topic, and a text, that are interesting to people who normally wouldn’t take philosophy classes. You’ll get more topics for fruitful discussion than you can easily handle. And, especially in a university with any kind of diversity, you’ll get the chance for you, and the students, to learn from how the lived experiences of the different members of the class interact with the theoretical issues at hand. I know many universities have been adding, with great success, courses on the ethics of food. A course on the ethics of immigration could have a similar kind of success. I’m very pleased that my employer, the University of Michigan, has joined Coursera. The aim of Coursera is to provide free, online courses of something approaching university quality, to everyone. Right now it hosts courses from Penn, Stanford, Princeton, and UM-Ann Arbor, with possibly more schools to be added soon. Recently Kevin Drum asked his readers for podcast recommendations. I learned two big things from his nice summary of the replies. One is that the In Our Time archives have now been made available. This is a very nice thing for the BBC to do, and I suspect I’ll be spending a lot of time listening to them over the forthcoming months. The other is that there is a lot of demand out there for philosophy podcasting. As well as In Our Time (which has over 60 philosophy programs in its archive), there were a lot of recommendations for David Edmonds and Nigel Warburton’s Philosophy Bites. So in the interest of satisfying that demand, I thought I’d post a link to a couple more philosophy podcasts, and see if CT readers had suggestions for more. Philosopher’s Zone is a weekly philosophy show on Australia’s Radio National. It features a mixture of public lectures, interviews with philosophers, and programs on specific topics. The 10-Minute Puzzle is a new podcast series out of the Northern Institute of Philosophy centre in Aberdeen. It basically does what it says on the tin: introduce a philosophy puzzle and some of the natural solutions to it in 10 minutes. The links I’ve posted so far have a pretty high concentration of male presenters. But I’m sure that if I knew more about what was available, that imbalance would be somewhat corrected. So, any further suggestions? Last week the linguistics department here at Michigan hosted the 2012 Marshall M. Weinberg Symposium. The theme for this year’s symposium was bilingualism. I learned a ton from the various speakers, much of it about how hard it was to learn a second language after very early childhood. Even people who appear, to naive judges, to be fluent in a second language they learned after childhood, perform well below native speakers at cognitively demanding linguistic tasks, such as understanding speech in noisy environments, or explaining proverbs. I don’t have the citation link for this, but Jürgen Meisel reported that German students learning French by immersion did much better if the immersion started between 32 and 42 months than they did if they started after 42 months. The errors that he reported were common among the older learners after several months of immersion, like not getting the genders of articles right even for words like maman where you would think it was obvious, were really striking. Karen Emmorey reported that the same thing was true for learners of ASL; late learners can become fluent enough for practical purposes, but are never as good as people who learn ASL in early childhood. The striking contrast to all this is how successful first language acquisition is. To a first approximation, 100% of people successfully learn the syntax of their first language, and do so at a staggeringly young age. I realised a few days after the symposium that there was a huge question I wish I’d asked. Why are we so good at learning a first language, and so poor at learning a second language. What cognitive system would have such a feature(/bug), and what evolutionary advantage could there be to having such a system? Where are the baby boomer philosophers? Eric Schwitzgebel has a fascinating post about how little influence baby boomers have had in philosophy. He uses a nice objective measure; looking at which philosophers are most cited in the Stanford Encyclopaedia of Philosophy. He finds that of the 25 most cited philosophers, 15 were born between 1931 and 1945, and just 2 were born between 1946 and 1960. Nate Silver had a tweet this morning that’s relevant to a debate that went on here a month or so ago. The median American’s non-household wealth declined by 14% between 2001 and 2007. So when household wealth evaporated, guess what happened? I’m not sure of the source of this, so take some of this with a grain of salt. But if it’s true, it is relevant to something Daniel Davies claimed and Brad DeLong rejected, namely (to quote Daniel) “we are in a recession basically because of the disppearance of a huge amount of household sector wealth”. I basically think Daniel is right on this, and Brad wrong, for reasons I’ll go into below the fold. And I take it Nate is endorsing Daniel’s line, namely that the recession was brought about by a huge collapse in household wealth. If AV is so god damned simple, why can nobody explain convincingly to me whether it screws the LibDems or not? This seems like a fun question to work through at longer than Twitter length, even if it is purely hypothetical, since the No side is going to win. One obvious answer is that as long as the Liberal Democrats are polling 10% the voting system won’t make a lot of difference. Another obvious answer is that if the Lib Dems recover at all, then AV would seem to help them. There will be plenty of seats, such as Oxford East which they lost under FPTP, but would have a very good chance of winning under AV. But if AV in England plays out in a similar way to how AV played out in Australia, there is a big risk to the Lib Dems. They could lose a huge portion of their vote to the Greens. 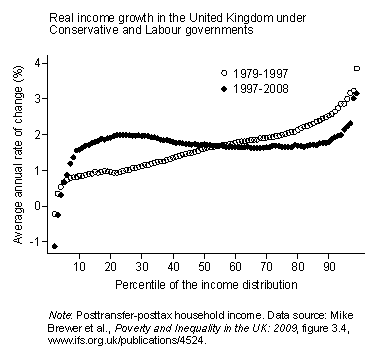 Matt Yglesias and Brad DeLong have argued that this graph, from Lane Kenworthy, shows that we shouldn’t be too critical of Labour’s performance with respect to inequality over their 12 years of government in Britain. Both Matt and Brad are pushing back against Chris’s post below, which argued that Labour had done very little about equality. (Although in his remark on my comment on his post, Brad now seems to suggest that his post was a pre-emptive strike against what Chris would go on to write in comments.) There’s a natural rejoinder on behalf of Chris, which has been well made in both Matt and Brad’s comments threads. Namely, if the graph really showed that things had gotten better, equality-wise, the Gini coefficient for the UK would have fallen. But in fact it rose, somewhat significantly, over Labour’s term. Indeed, the IFS Report that the graph is based on shows quite clearly that it rose markedly towards the end of Labour’s term. So I got to thinking about how good a measure Gini coefficients are of equality. I think the upshot of what I’ll say below is that Chris’s point is right – if things were really going well, you’d expect Gini coefficients to fall. But it’s messy, particularly because Gini’s are much more sensitive to changes at the top than the bottom. There is a small symposium in the New York Times today about the recent trend in analytic philosophy towards experimental philosophy. As some of the contributors note, it’s easy to overstate the trend that’s going on here. It’s not that for the 20th Century, philosophers used only armchair methods, and with the dawning of the 21st century they are going back to engaging with the sciences. When I was in grad school in the 90s, it was completely common to rely on psychological studies of all of uses, especially studies on dissociability, on developmental patterns, and on what was distinctive about people with autism or with Capgras Syndrome. And the influence of Peter Singer on work in ethics meant that purely armchair work in ethics was out of the question, whatever one thought of Singer’s conclusions. This was hardly a distinctive feature of philosophy in south-eastern Australia. Indeed, we were probably more armchair-focussed than contemporary American philosophers. As Ernie Sosa notes in the entry linked above, 20th century metaphysics is shot through with arguments from results in 20th century physics. The importance of objective chance to contemporary nomological theories is obviously related to the role of chance in different branches of physics and biology, and modern theories of it involve a lot of attention to various sciences. And I’ve lost count of the number of debates I’ve been in in philosophy of language where appeal has been made at one stage or other to cross-linguistic data, which is presumably not armchair evidence unless we assume that the person in the armchair knows every human language. It’s not that I think philosophers do as good a job as they should at drawing on evidence from sources outside traditional philosophy – I’ve even tried to encourage philosophers to do more of this – but they tend to see appeal to other areas of inquiry as a generally acceptable, and often important, kind of move. So it’s a bit of a stretch to say, as Joshua Knobe does, that in that time “people began to feel that philosophy should be understood as a highly specialized technical field that could be separated off from the rest of the intellectual world.” I’m really not sure which of the great philosophers of the 20th century could be characterised this way. Perhaps if you included mathematics in philosophy and not the “rest of the intellectual world” you can get a couple of great 20th century philosophers in. But I doubt it would get much beyond that. That’s not to say there’s nothing new or interesting that’s been happening in the last fifteen years or so. In fact I think there are three trends here that are worth noting. Recently Aaron S. Edlin, Andrew Gelman and Noah Kaplan wrote an article in The Economists’ Voice setting out their argument that rational altruists should vote. A more careful version of the argument is here, and if you like there is also a mocking response by Andrew Leonard in Salon, and a more sensible counter-mock by Gelman on his blog. There’s something right about the argument Edlin et al are making; it being rational for you to vote does require a degree of altruism. But I think their model (a) makes some fairly heroic assumptions, and more importantly (b) doesn’t explain why so many people in America should go vote today. Below the fold I give a slightly different reason for voting, one that applies in all 50 American states. The short version is that you should vote today because it increases your chances of getting a good outcome next time. My university (Rutgers) is fairly actively encouraging students to register to vote. And I’ve occasionally done a bit to help, hosting students who do a spiel on voter registration and personally encouraging students to vote. Now I think this is all a good thing. Voting is a good thing, and a healthy democracy requires a decent turnout of voters, so doing our little bit to help democracy is being on the side of the good. It’s not exactly related to the courses we’re teaching, but spending 45 seconds before class is officially scheduled to start encouraging voter registration, or putting voter registration ads on course management software as Rutgers has done, seems far from an abuse of official positions. Still, voting isn’t the only good thing in the world. It seems to me that voting in the upcoming election for Obama/Biden over McCain/Palin is pretty close to a moral requirement. (For those who are eligible to so vote. I of course won’t be voting for Obama, because that would be illegal, and undemocratic.) But it seems it would be seriously wrong for either Rutgers, or for me, to use our positions of authority to promote voting for Obama. And I think this isn’t a particularly controversial position. But it’s a little hard to say just exactly why it’s OK for Rutgers (and me) to do what we’re doing, and not do what we’re not doing. Below the fold I have a few thoughts on this question. Obama’s VP Candidate will be, presumably, announced today. On political grounds I’d prefer the candidate to be Kathleen Sebelius, but on historical grounds I sort of hope it will be Brian Schweitzer. Since Obama is finishing his pre-convention tour in Montana, it might be too. Here’s why I’d prefer it on historical grounds. In the lower 48 states of the US, there are four time zones, dividing the country up into roughly equal areas from east to west. In the early years of the country pretty much all of its population lived in the two easternmost time zones, the Eastern and the Central. (Actually in the very early years there probably weren’t such things as time zones, but the people lived in what are now the Eastern and Central time zones.) Even today, if this information is correct, about 77% of the population live in those two time zones. So you might expect that the Democratic Party would have taken a fair time to have someone run on its Presidential ticket who was either born outside those time zones, or lived outside those time zones. The first Democratic candidate (for either President or Vice-President) to be born outside the two easternmost time zones was Adlai Stevenson (1952, 1956), who was born in Los Angeles. Barring a major surprise, Barack Obama will be the second. After the Super Tuesday primaries in the U.S., there was a lot of discussion that various big-name endorsements seem to have not made much difference. Most notably, despite being endorsed by Governor Patrick and Senators Kennedy and Kerry, Barack Obama got beaten heavily in Massachusetts. But what struck me at the time, and what seems to have been confirmed by subsequent contests, is that (at least in Democratic primaries) mayoral endorsements seem to make an enormous difference in the campaign. Not only does the candidate with the most endorsements seem to routinely win, they seem to outperform their poll numbers.